All transactions are safe and secure with a reliable history in online purchasing behind each of our associates. Buy the Freddy Krueger All Night Long t-shirt to own Nightmare on Elm Street clothing and merchandise. A Nightmare on Elm Street t-shirts often feature Freddy in his sweater and fedora. This one focuses on his glove. It will let others know that you're ready to rock 'n' roll all night and never sleep again. 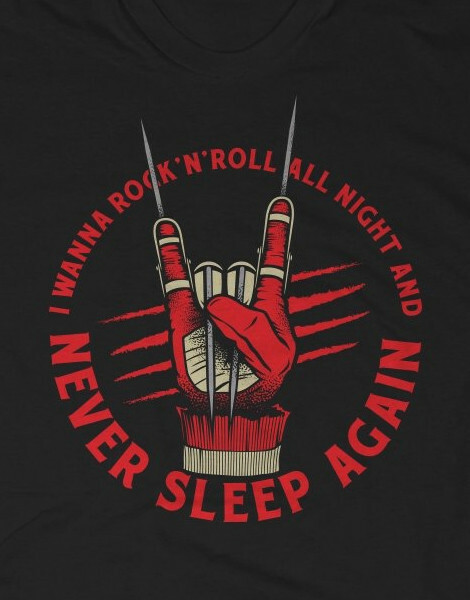 Whether your favorite is the original, the remake, Freddy's Revenge, Dream Warriors, The Dream Master, The Dream Child, Freddy's Dead, New Nightmare or Freddy Vs. Jason, this Rock 'n' Roll All Night Freddy Krueger tee is a perfect fit. In addition to the Freddy Krueger All Night Long tee above, browse the Nightmare on Elm Street Clothing Gallery for more apparel like men's and women's clothes, kids shirts or hoodies.